London, UK. 07/09/10 - The knock-out movie of the summer, The Karate Kid, arrives on Blu-ray Combi Pack and DVD on November 15, courtesy of Sony Pictures Home Entertainment. The action-packed, feel-good family film about how perseverance leads to triumph features rising star Jaden Smith (The Pursuit of Happyness, The Day the Earth Stood Still), martial arts legend Jackie Chan (Rush Hour, Shanghai Noon) and Academy Award® nominee Taraji P. Henson (2008, Best Supporting Actress, The Curious Case of Benjamin Button). The box-office smash is directed by Harald Zwart (Pink Panther 2, Agent Cody Banks) with a screenplay by Christopher Murphey. Powerhouse producer Jerry Weintraub (The Karate Kid 1984, Oceans 11, 12, 13) returns to the franchise, producing with Will Smith (Seven Pounds, Hancock), Jada Pinkett Smith (The Nutty Professor), James Lassiter (Seven Pounds, Hancock) and Ken Stovitz. Dany Wolf (The Nanny Diaries, Junebug), Susan Ekins (Oceans 11, 12, 13) and Han San Ping (Kung Fu Hero, Go Lala Go!) were the executive producers. The Karate Kid Blu-ray is filled with special features. The Blu-ray contains exclusive bonus features which include an alternative ending where fans can watch Jackie Chan fight, Production Diaries hosted by Jackie Chan and an interactive map of China which shows all of the amazing locations the movie was shot in. The Blu-ray Disc also contains movieIQ™+sync, a new and immersive BD-Live movie watching experience that uses a connected real-time movie database. With a movieIQenabled Blu-ray Disc and an Internet connected Blu-ray player, movie fans can dive into continuously updated information on the cast and crew while exploring relevant trivia such as production facts, music and soundtrack information, all tied to scenes within the movie. Additionally, movieIQ+sync gives viewers the full movieIQ experience on their computer or iPhone by linking to the Blu-ray disc. 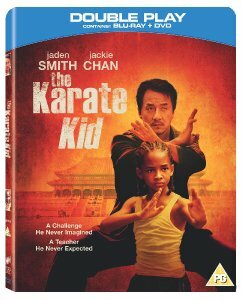 The Karate Kid will be available on Blu-ray Combi Pack from £26.99 and on DVD for £19.99. 12‑year‑old Dre Parker (Smith) could have been the most popular kid in Detroit, but his mother's (Henson) latest career move has landed them in Beijing, China. Dre immediately falls for his classmate Mei Ying ‑ the feeling is mutual ‑ but cultural differences make such a friendship impossible. Even worse, Dre's feelings make an enemy of the class bully, Cheng. In the land of kung fu, Dre knows only a little karate, and Cheng puts "the karate kid" on the floor with ease. Without any friends in a strange land, Dre has nowhere to turn until he meets maintenance man Mr. Han (Chan), who is secretly a master of kung fu. As Han teaches Dre that kung fu is not about punches and parries but maturity and calm, Dre realizes that facing down the bullies will be the fight of his life. The Karate Kid has a run time of approximately 140 minutes (Blu-ray) and 134 minutes (DVD) and is rated PG. The Blu-ray Disc version of The Karate Kidis BD-Live enabled, allowing users to get connected and go beyond the disc via an Internet-connected Blu-ray player to download content.